Ood Pants, Take 4 | Barbie Who? It has begun! 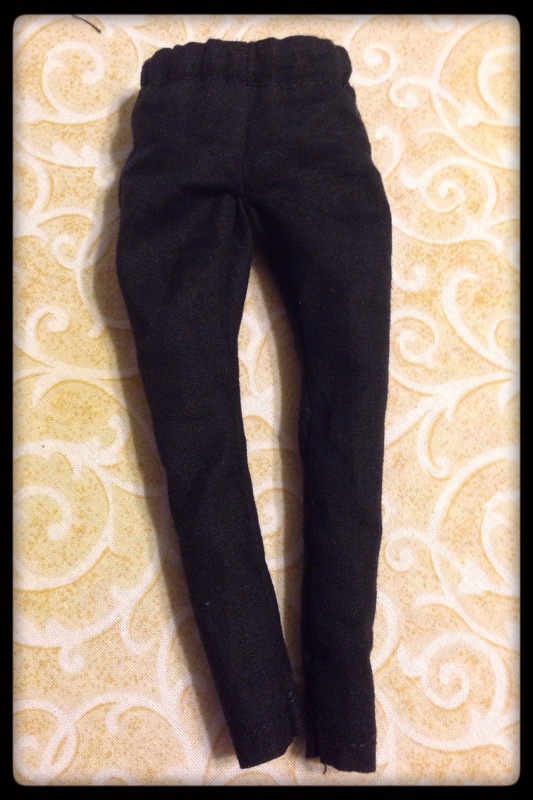 I have sewn my first garments for fashion dolls. It has been quite a journey. Sewing for dolls was different than anything I have sewn before. I am excited to tell you all about the terrifying lows, the dizzying highs, and the creamy middles. All sewing adventures start with choosing a pattern. I decided to use pattern G from Simplicity 1242. I was drawn to this pattern because it was simple and vintage; I absolutely adore vintage style. After browsing the instructions, I realized it was a straightforward pattern. It only required two leg pieces and some elastic for construction. After rummaging through a bin of fabric scraps, I assembled everything I needed for this journey. I began by unfolding the thin pattern paper. This is always the most nerve-wracking part for me. With a toddler at my legs, you never know when an arm will reach up and try to rip what I’m working with. Luckily, she was more interested in her blocks than what I was doing up above. Once I had found the pattern I needed, I used white copy paper to trace the pattern. I didn’t want to cut out the original because I am certain I will be making this pattern again. 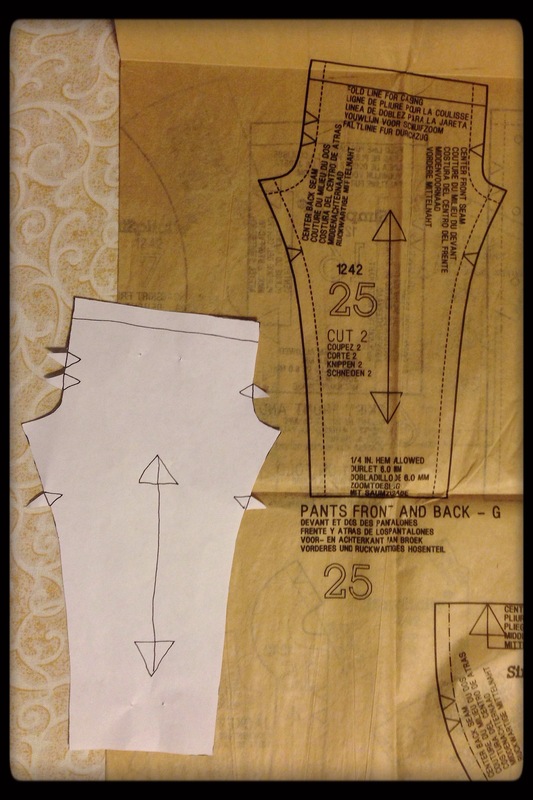 I don’t like to cut original patterns, and doll clothes are small enough that I can get away with this little cheat. Next, I ironed out a piece of scrap fabric. It was part of a fat quarter I had leftover from making a drawstring bag. I believe the fabric is 100% cotton, and it is somewhat thin. I figured it would be a good fabric to test this pattern. First, I folded the fabric over so that it had two layers. Then, I cut out the pattern twice. I wanted to make at least two pairs of pants just in case one had problems or the sewing machine decided to eat the fabric (I love my new machine, but it did that twice when I was making curtains – eek!). The first piece I cut out was exact to the pattern. The second pair had an added 1/4″ in the waist area. 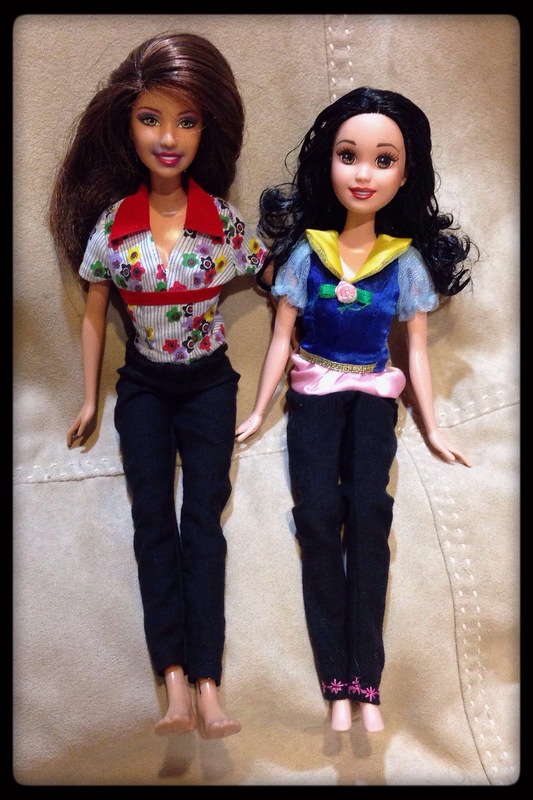 Bloggers Brie and barbielea suggested adding extra space in the waist to better fit modern dolls, and I figured I should listen to their experience. Once the fabric was cut, I made my way to the sewing machine. Before I started sewing, I read the directions that came with the pattern. They were composed of two blocks of text and two pictures; they certainly didn’t spell things out to the level I prefer. Being the visual person I am, I relied way too much on the pictures when assembling the first pair of pants. The first few steps went well. I sewed the front seam, pressed and sewed the top seam, and inserted the elastic without incident. Next, I looked at the second picture where it illustrates how to stitch the leg seams. I stitched up both legs, and then I went back to the back seam and crotch. That is when I realized my mistake. Because I waited to stitch up the back, it was hard to get the fabric to sit properly. The crotch area was particularly wonky. I read the written instructions again, and I was supposed to stitch the back seam before I stitched up the legs. Oops! I made the most of it, and when I was finished it wasn’t too noticeable on the outside. The seam is uneven when you look closely, but you can’t tell anything is wrong when the doll is wearing the pants. Once I had the pants sewn up, I realized I had made another mistake. The bottom of the pants had a raw seam! I forgot to fold over the fabric and hem the cuffs at the bottom (where the feet come out). I looked at the instructions and I didn’t see it in the written part or in the picture. Maybe patterns expect us to know to do those things? Maybe I can’t read? Maybe I’m a total noob? I’m not sure; it is probably a combination of all three possibilities. To fix this, I rolled the fabric into the pants and pressed it with the iron. Then, I hand-stitched the hem into place. It was tedious work, but I finished it quickly due to the small size of the piece. This first pair looks pretty good, all things considered. This was my first attempt at making doll clothes, my first time sewing with a 1/4″ seam, and my first time using this pattern. Even with the mistakes I made, the pants fit my Ood doll! It was a bit difficult to slide them over her hips, but it wasn’t impossible. The bigger challenge was making her giant feet fit through the bottom cuffs. Even with those small problems, I am very happy with how the pants turned out. Because the first pair of pants were a success, I decided to do something fun with the second pair. 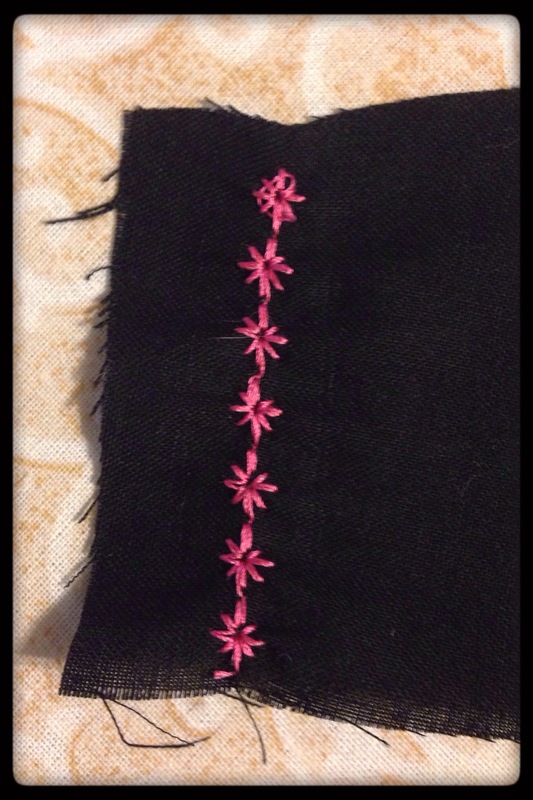 I used a decorative flower stitch on the bottom cuffs to make them more interesting. Decorative stitches are a big advantage to having a computerized sewing machine; I wanted to utilize that capability. It didn’t take long to thread the machine and sew it into the cloth. Before I started construction on this pair of pants, I made sure to re-read the instructions. Between what was written and what I remembered from the first pair of pants, they came together beautifully. The final seam was much easier to sew, and I didn’t have to hand-stitch anything. I am very happy with how it turned out, and I am stunned at how little time it took to make them once I knew what I was doing. It would take me over a week to knit or crochet a pair of pants, and I was able to make two of these in a little over an hour. Huzzah! I decided to let Snow White wear these trousers. 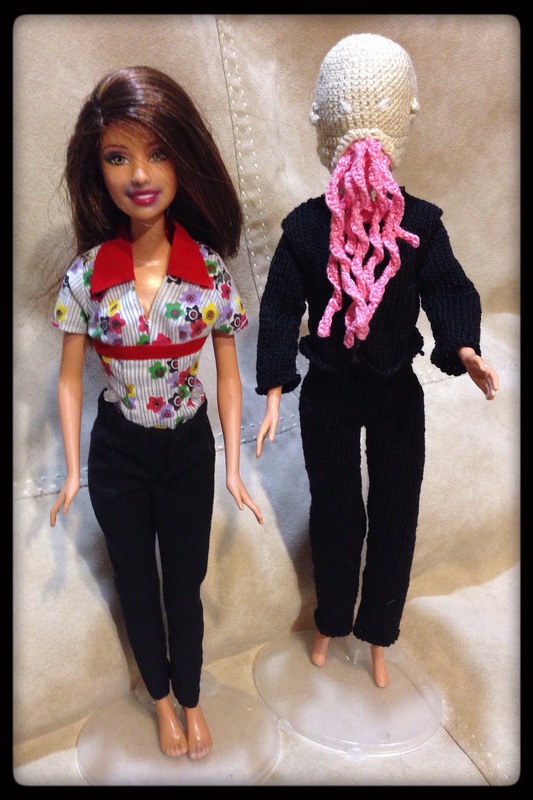 The pink detailing seems to fit her style better than it does for the Ood dolls. I also couldn’t get them to fit the Ood dolls. The first pair of pants had extra fabric in the waste. The smaller waist works great for dolls with a teenage body, but it was too small for modern Barbie dolls. Old patterns are fun! I guess I will plan on making at least two of anything I sew so that I can adjust them accordingly. One big problem I felt with both pieces involved the feet on my sewing machine. None of the feet that came with my machine sew a 1/4″ seam well. The feet are all better suited for a 1/2″ or larger seam, and I found myself sewing blindly on all the curves. It was easier to sew the straight area of the leg because I could guide the fabric on both sides of the foot. On every curve, I was afraid that I would sew myself out of the fabric or I would sew too far into the fabric. I don’t like gambling, so I had to find a solution. After doing a quick search online, I found a sewing foot that is designed for assembling doll clothes. I ordered it off of eBay, and I am waiting patiently for it to make it to our home. I have decided not to sew any more doll clothes until I receive the new foot. I want to make a jacket or shirt when it does arrive. I have enough scrap black fabric to make at least one shirt, and I don’t want to ruin it by using the wrong foot. One of the jackets included in this packet of patterns may work as an Ood jacket, after a few modifications. It is pattern E from Simplicity 1242. My only hesitation is that it looks a bit too long for an Ood. There are a few other jacket and shirt options in the other Simplicity patterns I bought. I will compare them before I make a final decision. We shall see what I come up with! I think I can say that one Ood will have a knit outfit while the second has a sewn outfit. I have also been playing around with a few other ways that I can differentiate them. Eye color is the first thing that comes to mind, but I have a few other ideas, too. What they hold in their hand is another way to differentiate them. One will have a hindbrain while the other has a translation orb. Before I hurt my wrist, I was playing around with different ways of making the translation orb. For now, I am stuck just looking for brain patterns online so that I can get a feel for how other people approach constructing a brain. Thus far, none of the patterns look like they can easily scale down to Barbie size, so I may be making my own pattern for that, too. Stay tuned! What is next? Well, my wrist is still on hiatus. I am doing some exercises to help build up strength, but I get pain and cramps whenever I try to knit or crochet. The way I have to bend my wrist is putting too much stress on it. I don’t want this injury to linger, but at the same time I have a lot of things I want to craft. I am trying to do one row for the Ood shoes every night just so that I can make some iota of progress. If I keep that up, the next Ood update might be the Ood shoes for the first doll. For now, I am going to focus on writing a few more posts about our summer and the cool Barbie things we found while visiting family. Thank you for reading about my first sewing adventure! I hope you have a fantastic day. I am so happy that the sewing was a success! The pants, both pair, look great! I’m not that great of a sewer (it’s mostly just Barbie clothes) and the things you learn to do with them is way different than sewing for human size, like remembering to do the hem before the final sew. I’ve had to hand stitch a ton of things, but this will help use up any leftover fabric which can be fun. I’ve finally figured out why the Ood. The first time I found your blog I had only seen them being mind controlled on the ship, and now I’ve seen so much more. You are definitely inspiring me to create some Dr. Who dolls, Donna and I’ve got the perfect Amy doll, and perhaps Rose, but man, there is not a single Ken that resembles any Doctor. I did find a decent Shaun Temple, though. I hope your wrist feels better soon! The Ood have a rich history considering how modern a monster they are. I’m glad you got sucked into it and are inspired to make your own dolls. I read online that they have come out with some Doctor Who dolls, and some are around the same size as Ken and Barbie. I have never seen them myself, though. I saw an Aladdin doll once and I thought it could make a decent 11 with a fez with a repaint, but other than that no doll has struck me as looking like a Doctor. Thank you! It is taking a bit longer than I had hoped, but luckily nothing is broken. Hopefully I can get back to crocheting so I can finish the shoes for the first Ood doll. And I always transfer my patterns as well, I find tissue paper works really well for me. I’ve got quiteva few vintage patterns and cannot bear to cut them up. Tissue paper is an excellent idea! I heard of people buying rolls of butcher paper for it, but I don’t have the space for one of those. Tissue paper seems to make much more sense. I will try to remember that. Honestly, I just use the leftover tissue paper from present because I’m a hoarder and can’t throw it out. 😛 But it works great, plus if I want to modify a pattern, I can trace it on another sheet and add the mods there. The pants came out well, vintage patterns are good fun to make things from as long as you remember to modify them for the newer bodies with bigger hips and smaller busts. Fraystopper is also your friend with tiny seams and hems when the material is fragile. 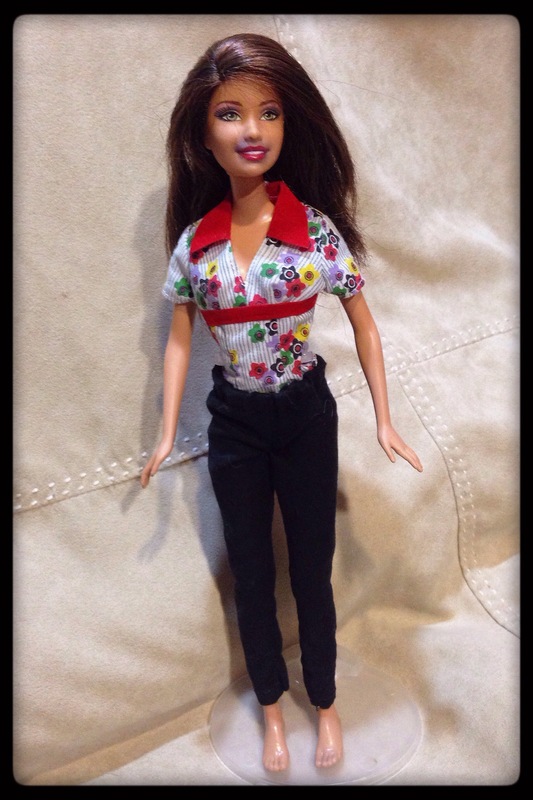 I often tack garments before I machine sew them because I find pins too big and awkward with Barbie clothes. I’m not a very good sewer but I have a go every now and then. I will have to try tacking. I found that doing the crotch of the pants was worrying because I didn’t know if the cloth was staying together. I should have tacked it to make sure it would feed correctly. I am such a novice sometimes!